Faculty of Pharmacy, Andalas University, West Sumatra, INDONESIA. Objective: A study of investigate the cytotoxicity activity of ethanolic extract of ginger (Zingiber officinale Rosc.) induced with arbuscular mycorrhizal fungi (AMF) against T47D cells line breast cancer have been conducted. Methods: Cytotoxicity were determined using the “microtetrazolium (MTT) Assay”, by measuring the activity of mitochondrial dehydrogenase in living cells that have ability to convert pale yellow of dissolved MTT to purple formazan product. The extract used at various concentration (0.1, 1.0, 10 and 100 μg / mL. The level of cytotoxic actifity was determined by calculating the inhibitory concentration (IC50) value that was based on the precentage of cell death after 24 h treatment with the extract. The change of cell morphology were observed by using inverted microscope. Results: The statistic results proved that ethanol extract of AMF induced ginger rhizome could barriers T47D breast cancers significantly at concentrations of 10 μg / mL and 100 ug / mL, with IC50 value was 12.5 ± 3.73 μg / mL. centration of 0.1 μg / mL, 1.0 μg / mL, 10 μg / mL and 100 mg / mL. Results of statistical analysis showed that the ethanol extract of ginger rhizome induced AMF at a concentration of 10 μg / mL and 100 μg / mL was able to inhibit the growth of breast cancer cells T47D significantly. Conclusion: The results showed the ethanol extract of AMF induced ginger rhizome was potential as herbal medicine for cancer-related ailments with IC50 value was 12.5 ± 3.73 μg / mL. Suharty N, Wahyuni FS,. 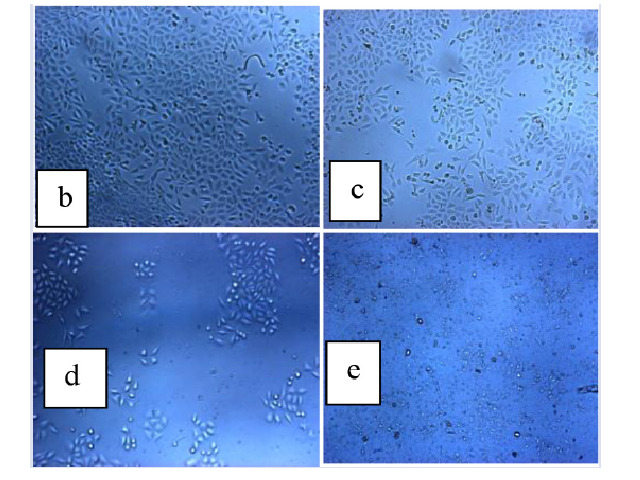 Cytotoxic Activity of Ethanol Extract of Arbuscular Mycorrhizal Fungi Induced Ginger Rhizome on T47D Breast Cancer Cell Lines. Pharmacognosy Journal. 2018;10(6):1133-1136.